After moving to Canada from Australia last year I never realized how many people get into Halloween here. Wanting to get into the spirit of things, I decided on a costume/character that I could easily construct, remain unique and something that people could easily identify. 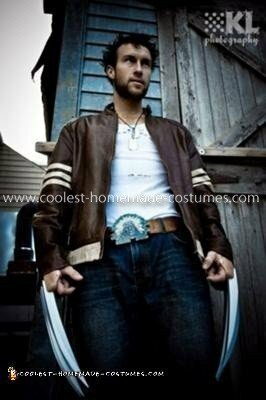 I couldn’t go past the fact that Logan (Wolverine) in the movie is Canadian and Hugh Jackman, like me, is Australian. I downloaded several pictures from the X-Men Origins: Wolverine movie to focus on getting all aspects of the character as accurate as I could and bored my housemates senseless by watching the movie several times to get in character. In the meantime I focused on growing a beard and hair so I could groom it to look as close as the real thing. 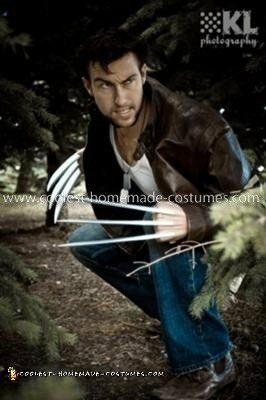 After purchasing the plastic wolverine blades and using them as a base I found the perfect leather jacket at a thrift store. With some basic masking tape, the stripes on the jacket were replicated in no time. I couldn’t find the exact belt buckle to buy online, so I decided to make it myself by transferring the image of a movie shot of the buckle onto glossy photo paper. I then cropped and re-sized the image to an appropriate size before gluing it onto a piece of thick cardboard box and injecting the cardboard with glue to reinforce it. Using an old metal belt buckle I then glued the new buckle onto it so I could attach it to the belt. For the tank top, I simply purchased one and replicated the tear marks from the movie after Wolverine fights Victor Creed. 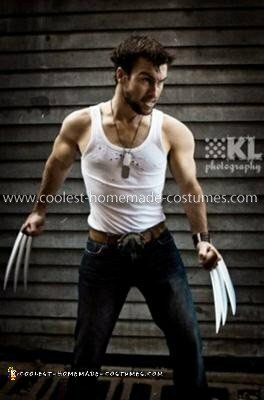 The adamantium bullet hole also adds to the homemade Wolverine costume. 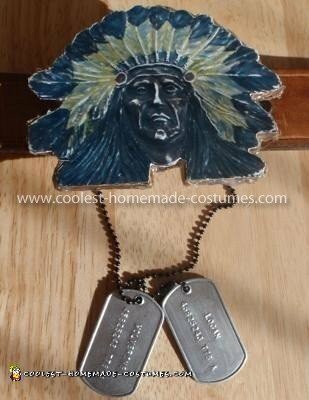 The dog tags were purchased off eBay but I got them customized to match the tags out of the movie with Logan’s military number, date of birth and blood type on them. Silver metallic paint made them look more realistic. After completing the outfit and having an awesome Halloween, my housemate who happens to be a professional photographer thought it would be cool to get some action shots. I think they speak for themselves. No comments yet? I’m surprised since this costumes rocks! Great job.